New York Rangers goaltender Henrik Lundqvist helped celebrate the return of the NHL with a guest spot on Late Night With Jimmy Fallon on Friday. Lundqvist appeared during Jimmy’s regular “Thank You Notes” segment, as the host thanked the league for ending its lockout. 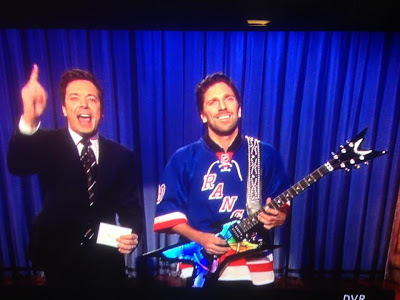 The feature wrapped with Fallon thanking the goalie for coming on his program to perform GNR’s “Sweet Child O’ Mine” on guitar, which Lundqvist then rocked with house band The Roots. Image courtesy of The Henrik Lundqvist blog.